Clients can discover coaches in the Coach.me app or on the website. You'll need to bring in your first clients yourself; as you get more clients, helpful ratings, and testimonials, you'll rise higher in search results. Clients can hire a coach by going into the detail screen of their habit (tap on it on your dashboard) and tapping the three dots at upper right to get to "Coaching Options". On that screen there's an option for hiring a coach. Clients can also tap the +symbol on their dashboard and browse habit categories or use the search box. 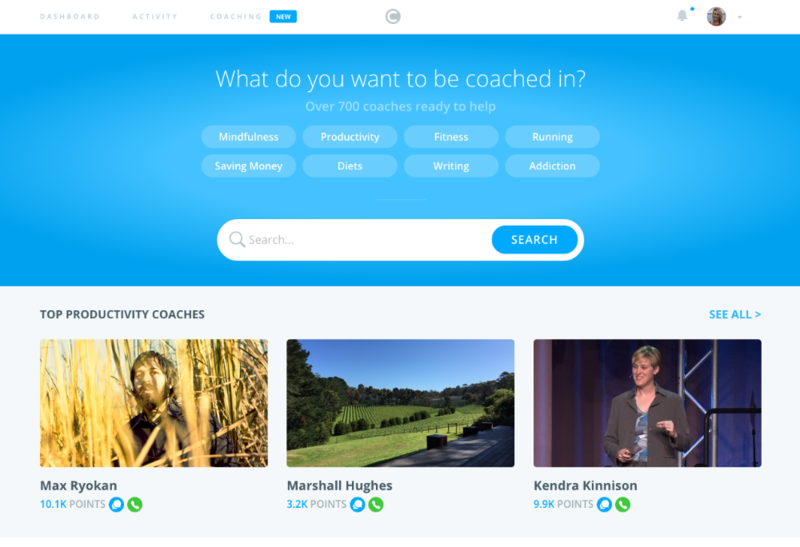 The listing of potential habits will include the number of coaches available for each one. Clients may also find a coach through the Coaching Showcase, which features top coaches in popular goals. There's also a big search box for finding coaches in specific goals (as seen in the image below). The icons display the kind of coaching available. A blue talk bubble signals chat-based coaching and the green telephone signals phone calls.